If you are at all familiar with the content Miketendo64 provides, than you would most definitely be aware of the fact that when it comes to Plantera, we have covered the 3DS, Wii U and Nintendo Switch versions quite extensively over the last few months and with the Switch version now available in Japan, of course we’d write a review for it! Even if it means me revising a lot of the points I brought up in the Wii U/3DS review I wrote regarding Plantera earlier this year! So without any more ado, here we go again! Originally developed by VaragtP Studios, Plantera first came to Steam in 2016 and has since then been making its way to various other platforms, with the likes of Spain based Ratalaika Games porting Plantera to 3DS, Wii U, PlayStation Vita and even the Nintendo Switch. Sure Rainy Frog Games are the publisher for the Japanese eShop release, but let’s pay credit where credit is due. It was Ratalaika Games who worked on the Switch version of the game, adding in the new details and getting it Switch ready, so good job Ratalaika, you helped bring Plantera to yet another platform and later on this year, you’ll be publishing the Western release and now we can properly get on with the review. So Plantera? If you have never before encountered this game or anything about it, it is a linear farming simulation game where you can grow your own garden and design it as you wish, whilst having to do battle with thieving wild life, who wishes to rob you of everything your “garden” grows. (Exciting right?) In fact, they are so obsessed with stealing, they’ll even steal the eggs your chickens hatch. (Talk about mean!) But as always, I’m getting a little ahead of myself, so I’m going to dial it back a bit and mention the lack of a story. It has no story. Why? Because Plantera is a simple yet elegant point and click “adventure,” that requires so little of you when it is at its most intense that it makes Plantera a game you can play whilst relaxing. Heck if you feel like doing no effort at all and just having the game play out, whilst watching it on TV, you can and I’ll explain why a little later on, but yes, regardless of what platform Plantera is on, it is a game you can relax to, as there is nothing stressful about it. But as always, I’m getting a little ahead of myself, so I’m going to dial it back a bit and mention the lack of a story. It has no story. Why? Because Plantera is a simple yet elegant point and click “adventure,” that requires so little of you when it is at its most intense that it makes Plantera a game you can play whilst relaxing. Heck if you feel like doing no effort at all and just having the game play out, whilst watching it on TV, you can and I’ll explain why a little later on, but yes, regardless of what platform Plantera is on, it is a game you can relax to, as there is nothing stressful about it. Now what about the actual gameplay? Well upon starting a new game, the player is presented with an almost barren field, save for a trio of butterflies you need to dispose of and a blue blob. Striking the butterflies by touching them, by pressing on the Switch’s touch-screen, sees you earning couple of coins. 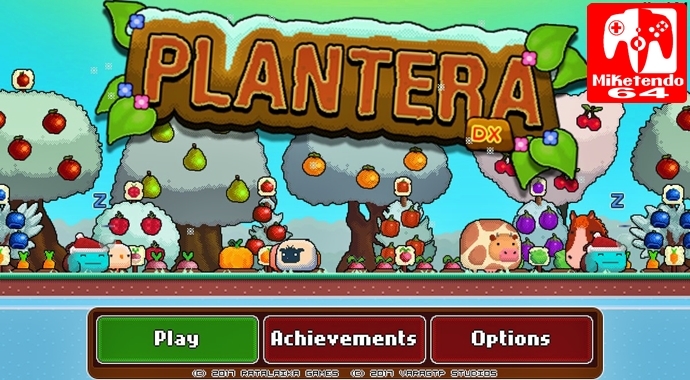 Enough coins in fact, to plant some carrots and then from there, Plantera DX truly begins. Although thanks to a new update for the Japanese version, support for controllers are available, so if you want to play with your Pro Controller, you can, but you can stick to touch-screen controls if you’d rather, if you want the personal touch. Just as soon as your planted carrots grow, your little blue blob worker will pick them for you, or you can pick them yourself by putting your finger to the screen once more and pressing them and then just as soon as you have enough coins, you can buy more carrots and then cycle repeats. Only this cycle it is not without its changes, as instead of just being one endless loop with no change whatsoever, the more you grow and earn, the more EXP points you will, which means you can level up and with levelling up comes access to new things such as plants, bushes, trees and even animals. The more you buy, plant and harvest, the more you can make in return, but what if you suddenly can’t plant anything else because all available spaces are occupied? Well when that happens, you expand your land by using the money you earn to buy another area and the true cycle repeats, the cycle that is buy, place, collect and expand. Only this loop is no infinity loop. There are no endless amounts of land you can buy as there are limits in place, but it will take you quite some time before you will even get to that point, so instead of focusing on that, instead focus on designing your little garden in a style of your own choosing. (Sure you can plenty all the stuff that gives you more money, but the garden is yours to do with what you want, so if you want to colour co-ordinate things, then why not? You can after all delete whatever you want, when you want thanks to its delete function. With regards to expanding though, because it is something players will do a lot, just know the bigger you make your garden, the more threats you will face as the likes of birds, wolves and even bunnies will be more prone to attack you. As for the likes of moles and ladybugs, while they are neutral, taking care of them will earn you a few more coins. However to prevent such attacks, players can either handle the threat themselves, or employ a bunch of adorable doggies and scarecrows that will do the work for them and will continue to do so even when the player steps away from the game and turns their device off. No that is not a mistake, I mean off. You can turn both Plantera and the Switch off and then come back to it the next day and find everything as you left it, along with (depending on your progress,) a hefty was of coins that are just dying to be spent, courtesy of your blue workers who never stop earning for you. But if that and everything else above is not enough of a reason for you to play, than how about the fact that there are 21 in-game achievements and they’re actually pretty fun to do as well, so if the cartoony, cutesy graphics don’t win you over, maybe the achievements will. Having played Plantera on 3 different platforms, it definitely gets better with every new release and Plantera DX does indeed live up to the “Deluxe Edition” status it has been given. Sure I may have something of a soft spot for it, the Switch version definitely has the edge on my previous favourite Wii U version, so I’m going to score it a 7/10 because anything less would simply not to!